Giveaway II - Super Inky! It's March 8! Do you know which holiday we celebrate today? It's International Women's Day! 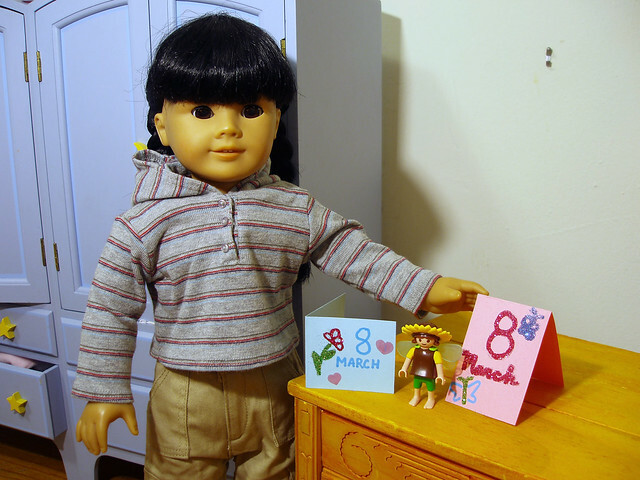 March 8 is like Mother's Day and Valentine's Day all rolled into one. It's very popular in Russia, which is why my family celebrates- I'm Russian! I received cards from my parents. Aren't they nice? I also received a new Playmobil fairy to go with my Playmobil Mushroom Guy. Then, Sonali came over. I wanted to take a picture of her wearing the next Giveaway Outfit. I used my new digital camera from my best friend Violet's parents. It has a timer feature, but it took me a little while to figure out how to use it, which explains the photo above! So this is the Giveaway for this week! 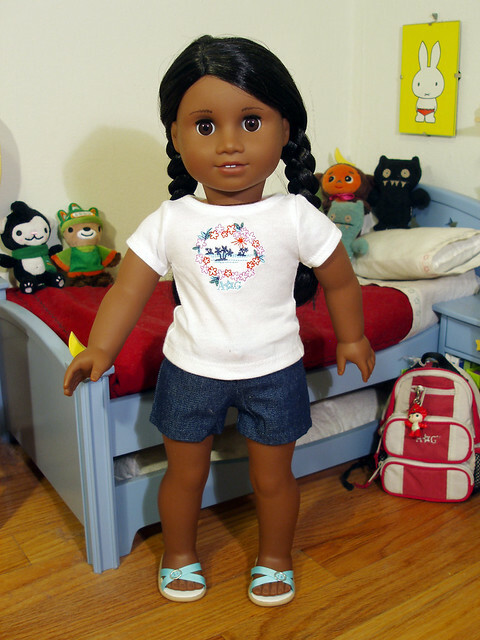 It's called the Vacation Outfit and it's the new Purchase with Purchase at American Girl Place. 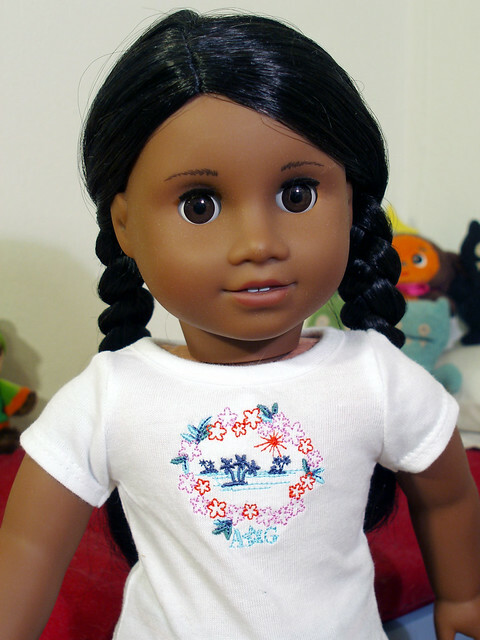 It has a white t-shirt with pretty flowers and a little island scene. There are also denim shorts, a colorful ribbon belt, and pretty shoes. To enter the giveaway, just leave me a comment in this thread. Just like last time, you can earn extra entries by making comments on older posts. You have to be 18 years old or older to enter the giveaway. If you are younger than that, ask an adult to enter on your behalf. You seem like a very nice girl, but you're going to be the death of me. You see, my daughter has gone all through your blog and wants to know why we haven't taken eight bazillion shots of Natalie and Lanie. 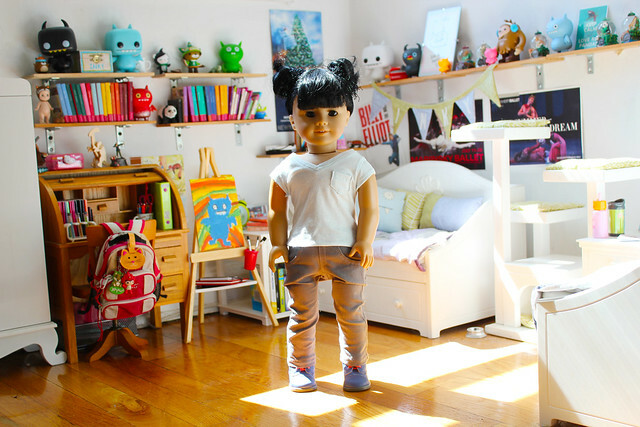 Now that we're creating a doll room in the corner of her room, she wants to do one of those picture series that looks like them walking into the room, hanging out, going to bed, etc. I'm sure that won't take more than...oh...two or three thousand pictures or so. Maybe you could explain to her that starting with just one or two cute pics would be a kinder way of breaking her poor mother into all this. You could do that, couldn't you? Oh, and the girls are loving all over the house's extensive Playmobil collection. It hadn't occured to them to play with them before. The stable is a big hit! I didn't know about that holiday! Sounds like a good one! Thanks for having another giveaway. Love this cute outfit. Looks great on Sonali! Oh Inky I am so happy you love your camera! I need to figure out the self timer on mine. Isn't it neat that we have matching cameras? I really want this PWP outfit, but I'm not entering your giveaway because I get too many presents from you, Colette and Jen already. Happy International Women's Day! :-) I vaguely recall learning about that holiday once. I wish I was better at remembering dates of things. Sonali looks great in that outfit! That tee is so cute! I do believe AG is getting better when it comes to clothing design. I mean, first the tee decorating in Avenue AG, then Lanie's tees, now this cute PWP tee! If I didn't know any better, I'd say that you and your awesome collection of t-shirts inspired AG to improve. That is a cute outfit-very versitile, too! Sonali looks great in it! What pretty, colorful cards! I especially like the purple butterfly :) Happy International Women's Day, Inky! Happy International Women's Day!!! We do need to get some shorts for camping this summer and would love to enter the contest. Not sure how many more comments we can make because we are doing lots of school work to get ready for spring break! It is so kewl that you are doing the give away's. This is Kelsyee, I am the one you might have read on the blog who went out for her first snowshoeing adventure and broke her leg. PS: We have permission from our parents to enter your giveaway. Hello and thanks for such a wonderful blog. My daughter loves reading through it. We love the new outfit and you are so nice to be doing all these giveaways! My daughter (and I) are craving a trip to a AGP store. All the exclusives are so tempting ... too bad we live so far away from one :( My daughter would love this outfit for her dolls. It is the first we have seen of it! Happy day after International Women's Day! Actually, shouldn't us girls be celebrated every day? This is also the first time I've seen this PWP outfit. It is so casual and perfect for an AG girl to be hanging out in. Hey!! I love your site!! I have 20 dolls. Kaya, Addy, Felicity, Elizabeth, Kit, Ruthie, Samantha,Nellie, Kailey, Lindsey, Jess, Mia, Angie (jly), Rebecca, Julie, and Chrissa. I also have 1 set of bitty twins, Max and Elliot. I also just got LANIE!! I also have Taylor my twin!! Hi Inky! 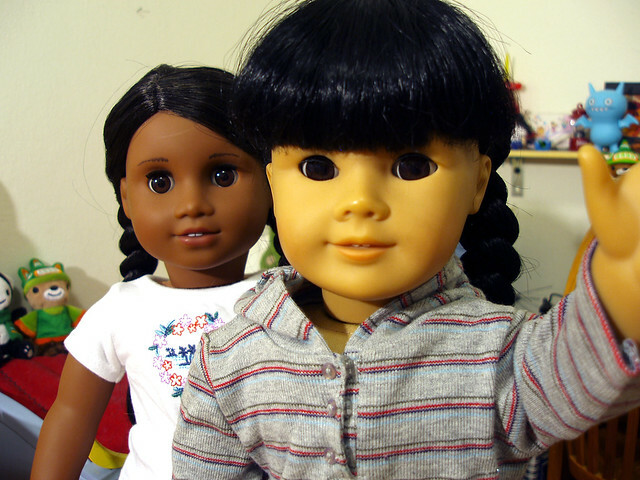 Do you like your playmobile doll? Happy International Womens Day!!! Happy International Women's Day, Inky! Yes, I am entering this giveaway as well. The outfit is adorable. It is weird how the US does not celebrate International Women's Day in the same way that other countries do. i love the outfit you are giving away! it is so cute! i love all your posts! Hi Inky! What an interesting holiday! I'm really glad we found your blog! I love the sandals that go with this outfit!! So sweet! I love that outfit, I'm so glad to see denim shorts. I guess this means spring is coming! i would like to enter please! i now know where the mystery shorts that lanie was wearing came from!!! That's a pretty nifty outfit, Inky. Congrats on the camera and good luck figuring it all out. Self timers are tricky until you get the hang of them. Hello, I am Sierra's mom and I would like to enter. I love your new fairy, Inky! Hi, Inky! I love your blog. I would love to enter your giveaway (I have my parents' permission). 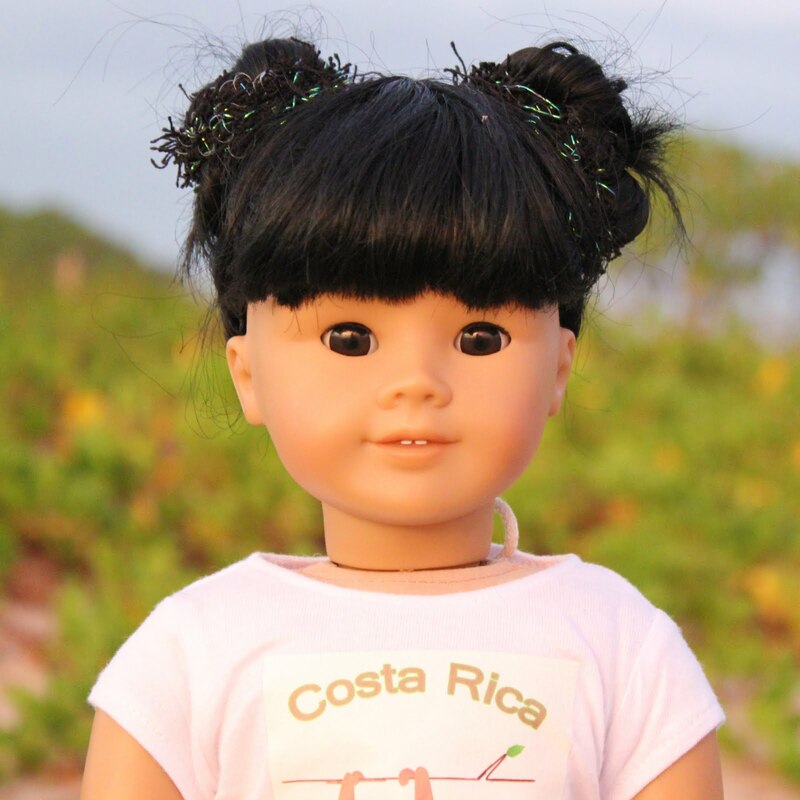 I have five dolls,Felicity, JLY #23 (Adrienne), Chrissa, Gwen, and Rebecca, and they would love to have this outfit as one of them is coming to Hawaii with me soon. They would want to wear it there! Hi Inky! 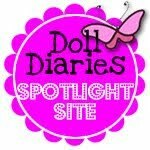 My dolls and I love your blog! The outfit is very cute too! I wish you could just buy it as a regular outfit, I don't live near any of the stores :'(. Needless to say, I'd like to enter! Happy Women's Day! We women rock don't we? Well, in 18 inch form anyway! I'm gonna go ahead and enter! Hi, I'd like to enter. Thanks Inky!